We noticed the following help wanted ad in our email box recently. So did Jim DuFresne and it made him reminisce about the two years he worked for a guiding company in Southeast Alaska. Was it his dream job? Read on. Later this month DuFresne will be giving his new presentation, A Place Called the Porkies, at the Solar Club on Feb. 27 at 7 p.m. at St. Paul’s Presbyterian Church, 27475 Five Mile Rd., Livonia, just west of Inkster Rd. Non-members are welcome. Jim will also be giving the same show about Porcupine Mountains Wilderness State Park at the Quiet Water Symposium on Saturday, March 3 at the Michigan State University Pavilion. Jim will speak on the Main Stage at 10:45 a.m. but will be manning a booth the rest of the day in the main pavilion. Alaska Mountain Guides and Chilkat Guides are looking for a few good men and women this summer. Actually the company is looking for wilderness guides to lead clients on sea kayaking trips, raft floats, rock climbing adventures and canoe outings. They even need administrative assistants to help with logistics, book keeping and other facets of their summertime tour operations. Located in Skagway and Haines, the only two towns you can actually drive to in Southeast Alaska, the company will stage training weeks for new employees in April and May. You can apply online. Dream job? Being a recreational guide in one of the most beautiful regions in Alaska? It’s not for everybody, even those who love the outdoors, but it was for me for two years in the early 1980s when I was single and poor and working for Alaska Discovery before it was absorbed by Mountain Travel/Sobek. At the time AkDisco, as we called it, was based in Juneau and Glacier Bay and I did a bit of everything, from kayak rentals to press releases. One morning I was even pressed into service as a bird expert when our biologist on staff called in sick. I met a half dozen clients off a cruise ship and drove them to the start of the Perseverance Trail. When they hopped out of the van with bazooka-like sighting scopes and personalized leather pouches for their Peterson Field Guide to the Birds West of the Rockies, I knew right then and there I was doomed. I’m not a birder. I could identify bald eagles, but that was about it. In the end it didn’t matter. They certainly didn’t need me to identify winged wildlife. Rather they appreciated the fact that I had been on this trail many times before and was carrying 30 pounds of lunches, snacks, drinks, jackets and a few camera lenses, none of them small. We had a great time and I even learned a thing or two about birds. 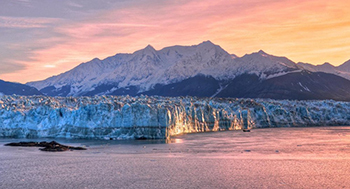 The 6-mile face of Hubbard Glacier at sunset. But the outings I loved the most were multi-day wilderness adventures. I served as one of the guides in canoe-and-portage crossing of Admiralty Island, home to more than 1,600 brown bears, and sea kayaking trips in Glacier Bay National Park. My favorite by far was my final trip for AkDisco when I guided a half dozen clients in Russell Fiord to witness Hubbard Glacier, the most active glacier in Alaska. This was before cruise ships basically took over the frozen attraction. Back then the only way for most people to experience Hubbard’s amazing display of crashing ice bergs was to be dropped in by a beach-lander plane and paddle to it. In Yakutat, we crammed into an old Beaver and the pilot, who wore cowboy boots, chewed tobacco and had a spit cup between his thighs, flew to Nunatak Fiord, a side arm of Russell Fiord. He then skimmed over Nunatak’s rocky beach until he found a spot where he thought we could safely land. The first time the over-inflated tires hit the beach they bounced right back in the air. On the third try he managed to keep the plane on the ground and bring it to a sideway stop. My clients, who came as far away as San Francisco, New York City and Florida, were white-faced dazed when they stepped out and the pilot had tobacco juice all over his boots. I was stoked; what great way to start an eight-day adventure! While waiting for the second flight of the beach lander I carefully assembled four Kleppers, the famous German collapsible kayaks we used. With an odd number in our group I was in a double Klepper by myself stuffed with food, group gear and boxes of wine. The first day was short, just a two-hour paddle out of Nunatak into the much larger, 35-mile long Russell Fiord. After we landed at our camping spot, one of the wives came up to me and said she was tired and wondered if I could set up her tent and inflate her Therm-A-Rest sleeping pad. I guess she already knew how to unroll her sleeping bag. Ice calving off Hubbard Glacier. My first urge was to tell her to set up her own tent, that I just got done paddling a kayak over-loaded with more than a week’s a worth of food and wine. BY MY SELF! Then I remembered the Tom Sawyer Rule of guiding. Long multi-day trips like these are only successful if you can quickly convince your clients that setting up tents, helping in the kitchen, even washing dishes is part of the grand experience that they just paid $3,000 for … per person, not including round-trip airfare to Juneau. I called the group over and said “let me show you how to set up these dome tents. The poles can be a little bit tricky.” It worked. Everybody scuttled away to look for a flat space and within an hour we had a little dome village. The next few days fell into a pleasant routine of early morning coffee, breaking camp and loading kayaks, four or five hours of scenic paddling and after dinner campfires with a glass or two of cheap boxed wine that was deeply appreciated by everybody and never refused. We had both red and white. The group blended together beautifully as we became acquainted with each other. The New Yorker I quickly learned had a bad case of “bear scare.” It’s a pretty common infliction in Alaska among urbanized clients. It started out with him asking if I thought we’d see a bear. I replied it’s possible and most likely if we do we’ll be paddling and the bruin will be on shore. Definitely not enough reassurance on my part and he peppered me with bear questions daily. What if one charges into our camp he finally asked one evening? That’s when I made a huge mistake. “Actually it’s for the clients, it makes them feel safer when they see it,” was his reply. That was true. Every evening the New Yorker wanted to see it. Then he wanted to hold it. When he began rubbing the stock that was it. He was freaking me out, more than a 1,000-pound grizzly, and I never pulled it out of my Klepper again. I think he was genuinely disappointed that we never saw a bear the entire trip … or maybe never fired the shotgun. I noticed he was the only one that didn’t tip me at the end. By day five or six we had reached Gilbert Point and the climax of our adventure. We set up camp on the point where less than a half mile east was the face of Hubbard Glacier. The 6-mile face of Hubbard Glacier. In between us and that wall of ice was Osier Island. Watching ice fall from the face of Hubbard Glacier from Osier Island. Hubbard is renowned for being the largest calving glacier in North American, a river of ice that’s 25 percent larger than Rhode Island. It begins at Mt. Logan, Canada’s highest peak, and flows 76 miles to Russell Fiord, where its face towers 350 feet above the waterline or what’s equivalent to a 30-story building. And it’s extremely active, advancing 80 feet per year. 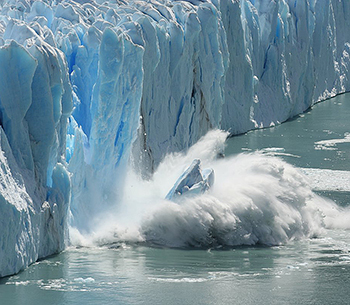 By the time the ice calves into Russell Fiord, it’s 450 years old. The key to viewing this frozen phenomenon was waiting for slack tide and paddling over to Osier Island with enough water, snacks and lunch to last until the next slack tide six hours later. In between the periods of calm water, this narrow gap where the fiord empties into Disenchantment Bay becomes a raging river of frothy whitecaps. Once on the island we hiked to the bluffs on the east side with our Therm-A-Rests in hand and made ourselves comfortable. Slowly but steadily the show began. The current increased as the tide came in and gradually Hubbard came to life, a falling ice berg here, another a mile away. The action picked up with the tide and at its peak we watched a continuous calving, ice bergs the size of pick-up trucks, small houses and three-story condos exploding off the face in front of us. At one point, for more than an hour, nobody said word. We were all too mesmerized by what was taking place only a few hundred yards away. When the next slack tide arrived we begrudgingly picked up our gear and paddled back to Gilbert Point. That night we knew when peak tide was occurring even though we were in our tents. We could hear ice crashing. Breakfast the next morning was subdued. Our final hours in Russell Fiord were spent packing gear, dismantling Kleppers, waiting for the beach lander. I had long since learned that the combination of witnessing natural wonders so close and spending days in the wilderness with so few obligations – other than setting up your own tent – makes even the most homesick client sad about leaving. But such an experience can’t help but permanently alter their way of thinking about the environment and the world around us. And usually for the better. That for me was always better than any tip they handed me at the end. 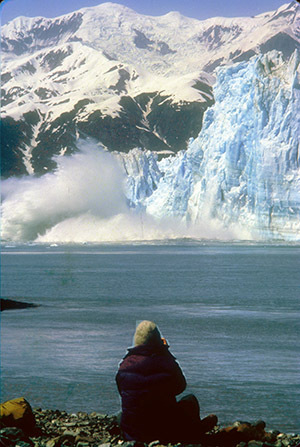 Editor’s Note: In 1986 and again in 2002, Hubbard Glacier surged forward, blocking the outlet of Russell Fjord and creating “Lake Russell.” In both cases the “dams” failed within two to four months due to raising lake levels and excessive rainfall. Hubbard Glacier is still active today and often cruise ships have to cancel side trips to it, much to the disappointment of their passengers, due to excessive ice flowing into Disenchantment Bay.